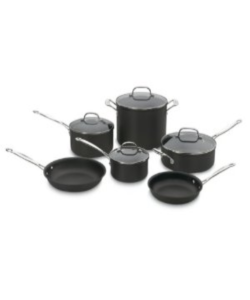 stockpot, a 3.5-quart sauté pan, and 8 and 10-inch skillet, and two saucepans measuring 1.5 and 3 quarts. All of the pans include tempered glass lids, with heat-safe handles, and all of them are constructed of hard-anodized aluminum, with a non-stick coating. It comes with a lifetime warranty, in contrast to the 5-10 year warranties offered by other manufacturers. The set can be found at prices from $120-$150, significantly cheaper than similar sets from other manufacturers. This makes it an ideal choice for new homeowners, college students, aspiring chefs or anyone else furnishing a kitchen for the first time. It has a durable non-stick coating, which allows cooking without the use of oils or cooking sprays. It is thus an excellent option for those who favor low-fat recipes, and the non-stick Quantanium coating makes cleaning up quick and painless, even after the messiest dishes. All of the pieces in the set are oven-safe at temperatures up to 500 °F, which means they can be used for baking or stovetop cooking. The non-stick coating used in the Cookware Set is extremely durable, although metal utensils should be used with care, as they can damage even the most durable of non-stick finishes. While the Cookware Set is an excellent value for the money, and a great introductory cook set, there are a few drawbacks. The Quantanium non-stick coating can wear off slowly over or form bare spots if subjected to high heat for long periods of time. The aluminum construction results in extremely quick heating, which can be problematic for recipes that call for a slow-even heat. All of the pots and pans in the Cuisinart Chef’s Classic Nonstick Hard-Anodized 10-Piece Cookware Set should be hand-washed for best results, although this is true of most cook sets with non-stick finishes. 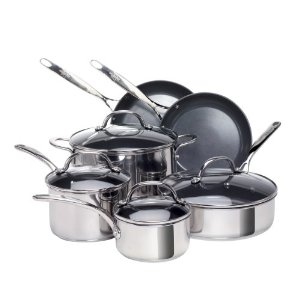 The Cookware Set includes glass lids, which require more maintenance than the solid metal lids offered in other cook sets. While they clean easily and allow direct observation of food during the cooking process, the glass can become cloudy if not polished with care, and hard water and soap deposits are more noticeable. Despite these drawbacks, the Cuisinart Chef’s Classic Nonstick Hard-Anodized 10-Piece Cookware Set Cookware Set offers a pot or pan for almost every use at an excellent price point, and should be considered by anyone setting up a kitchen for the first time.